Euphorbia esula has hairless, non-woody stems that sprout from a woody crown root and have alternate, frosted, lance-shaped leaves that are bluish-green in colour. Its height ranges from 5- 90cm. During summer, this plant has yellow bracts (leaf-like petals), which contain greenish-yellow flower clusters at the top of the stem. It grows in very dense stands. Euphorbia esula is one of the first plants to emerge in the spring. Stem elongation is very rapid as daily temperatures increase from May through June. Seedlings may emerge when temperatures are near freezing. They may appear deep red or purplish and as the growing season progresses some seedlings will appear to dry up and die but their underground parts will persist and produce adventitious buds especially near the hypocotylar end of the shoot. The main seedling shoot usually does not survive and flower because of the rapid development of adventitious organs. It is replaced by an adventitious shoot that will mature into the flowering shoot. Inflorescences form on the main axis from May to the end of July with flowering and seed development again occurring for a short time in the fall, usually from axillary branches. Seed development and maturation continue for 4 to 6 weeks after the appearance of the last flowers with seed dispersal. The plant usually ceases to grow during the hottest and driest weeks of the growing season. Stems from seedling or root buds generally do not flower the first year. During senescence in the fall, the plants turn a golden-yellow or reddish-yellow before the leaves fall from the plant. 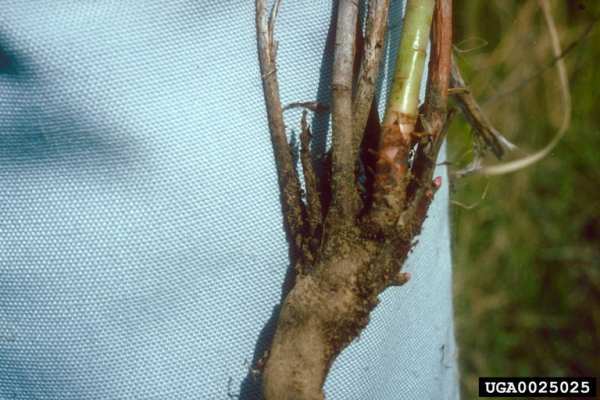 The naked stem axis is woody enough to persist from summer to summer and remnants of it can be seen at the base of newly emerged shoot. As light becomes limiting, plants fail to flower, decrease in density, and increase in height. As patches develop, density reaches over 200 shoots/sq m. On heavy soils about 60% of the shoots are produced from seed, whereas on light soils density is maintained and increased mainly by vegetative reproduction (Biesboer, 1996). Euphorbia esula has nutrient value similar to alfalfa (Medicago sativa L.) and crested wheatgrass (Agropyron cristatum (L.) Gaertn.) and provides nutritious forage for sheep and goats. Leafy spurge is used by bee keepers as an early-season food source to maintain honeybee (Apis spp.) colonies in early spring, but the honey is bitter and not sold for human consumption. Euphorbia esula prefers areas of full sunlight and dry soil but can tolerate a variety of habitats, such as roadsides. 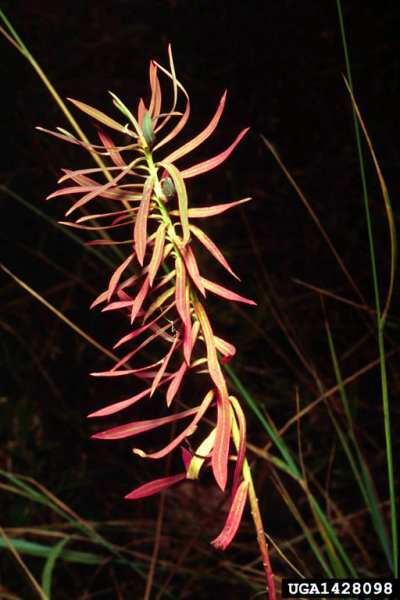 E. esula is found on prairies, savannas, mountain meadows, and near woodlands. Euphorbia esula produces flowers following its first year. Each plant can produce up to 200 seeds, of which 60% to 80% will germinate. The seeds are contained in a three-celled capsule which bursts when ripe and shoots seeds up to 4.5 m away from the parent plant. Leafy spurge also spreads from buds on lateral secondary roots. May be introduced for its colourfully yellow bracts.May be accidentally mixed in agricultural seed. Recommended citation: Global Invasive Species Database (2019) Species profile: Euphorbia esula. Downloaded from http://www.iucngisd.org/gisd/species.php?sc=83 on 22-04-2019. E. esula has spread to more than 2 million ha of rangeland in the northern Great Plains, causing estimated production losses, control expenses, and other economic damages in excess of $100 million per year (Anderson et al., 2004). Leafy spurge spread has been estimated up to 12 to 16% per year (Duncan et al, 2004). E. esula infestations in grazing pastures dramatically reduces desirable species and because of the latex cattle avoid grazing areas where leafy spurge is found. Leafy spurge also causes losses due to reduced wildlife-associated recreation and reduced soil and water conservation. Leafy spurge has invaded the habitat of the western prairie fringed orchid (Platanthera praeclara) which is an endangered native species of the tall grass prairie in the northern Great Plains of North America and threatens to further reduce the orchid’s remaining habitat. Integrated management: A. czwalinae and A. lacertosa combined with a fall-applied treatment of herbicides such as picloram plus 2,4-D or imapzpic reduced leafy spurge density 3 to 5 years earlier than when either method was used alone and once reduced, the Aphthona flea beetles maintained acceptable control for at least 7 yr. Spring-applied herbicides eliminated the adult food source and negatively affected the flea beetle establishment, but fall-applied treatments did not reduce the flea beetle establishment or its reproduction (Lym & Nelson, 2002). Also, incorporation of Aphthona spp. with sheep or goat grazing has resulted in a larger decline in leafy spurge production than insects alone (Lym, 2005). Informations on Euphorbia esula has been recorded for the following locations. Click on the name for additional informations. Anderson, Gerald L., Prosser, Chad W., Wendel, Lloyd E., Delfosse, Ernest S., Faust, Robert M., 2003. The Ecological Areawide Management (TEAM) of Leafy Spurge program of the United States Department of Agriculture-Agricultural Research Service. Pest Management Science. 59(6-7). June-July 2003. 609-613. Bangsund, D. A., Leistritz, F. L., Leitch, J. A., 1999. Assessing economic impacts of biological control of weeds: The case of leafy spurge in the northern Great Plains of the United States. Journal of Environmental Management. 56(1). May, 1999. 35-43. Caesar, A. J. 2003. Synergistic interaction of soilborne plant pathogens and root-attacking insects in classical biological control of an exotic rangeland weed. Biological Control. 28(1). 144-153. Summary: Supplementing flea beetle establishments with plant pathogens, for increased effectiveness in biological control of Leafy spurge. Caesar, Anthony J., 2006. Uromyces scutellatus as a keystone species affecting Euphorbia spp. in Europe as shown by effects on density in the field. Biocontrol Science & Technology. 16(10). NOV 2006. 1079-1086. Davies, Kirk W., Sheley, Roger L., 2007. A conceptual framework for preventing the spatial dispersal of invasive plants. Weed Science. 55(2). MAR-APR 2007. 178-184. DiTomaso, Joseph M., 2000. 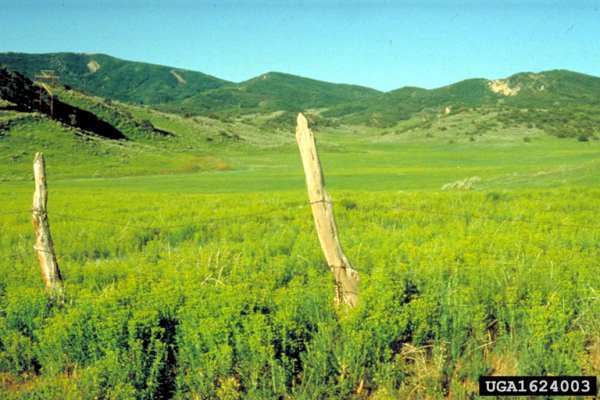 Invasive weeds in rangelands: Species, impacts, and management. Weed Science. 48(2). March-April, 2000. 255-265. Ferrell, Mark A., Whitson, Thomas D., Koch, David W., Gade, A. E., 1998. Leafy spurge (Euphorbia esula) control with several grass species Weed Technology. 12(2). April-June, 1998. 374-380. Hyder, Ayaz, Leung, Brian, Miao, Zewei., 2008. Integrating Data, Biology, and Decision Models for Invasive Species Management: Application to Leafy Spurge (Euphorbia esula). Ecology & Society. 13(2). DEC 2008. Article No. : 12. Jordan, Nicholas R., Larson, Diane L., Huerd, Sheri C., 2008. Soil modification by invasive plants: effects on native and invasive species of mixed-grass prairies. Biological Invasions. 10(2). FEB 2008. 177-190. Joshi, Ankush., 2008. Integrating flea beetles (Aphthona spp.) with herbicide and grasses for leafy Spurge (Euphorbia esula) management. Weed Technology. 22(3). JUL-SEP 2008. 523-529. Kalischuk, A. R., Bourchier, R. S., McClay, A. S.., 2004. Post hoc assessment of an operational biocontrol program: Efficacy of the flea beetle Aphthona lacertosa Rosenhauer (Chrysomelidae: Coleoptera), an introduced biocontrol agent for leafy spurge.Biological Control. 29(3). March 2004. 418-426. Kremer, Robert J., Caesar, Anthony J., Souissi, Thouraya., 2006. 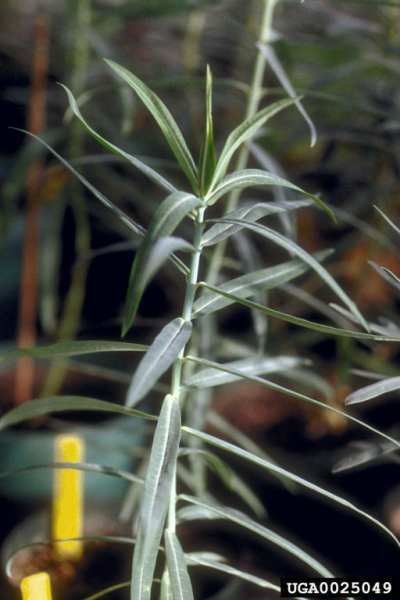 Soilborne microorganisms of Euphorbia are potential biological control agents of the invasive weed leafy spurge. Applied Soil Ecology. 32(1). MAY 2006. 27-37. Larson, Diane L., Grace, James B., Larson, Jennifer L., 2008. Long-term dynamics of leafy spurge (Euphorbia esula) and its biocontrol agent, flea beetles in the genus Aphthona. Biological Control. 47(2). NOV 2008. 250-256. Larson, Diane L., Grace, James B., Rabie, Paul A., Andersen, Paula., 2007. Short-term disruption of a leafy spurge (Euphorbia esula) biocontrol program following herbicide application. Biological Control. 40(1). JAN 2007. 1-8. Lym, Rodney G., 1998. The biology and integrated management of leafy spurge (Euphorbia esula) on North Dakota rangeland. Weed Technology. 12(2). April-June, 1998. 367-373. Lym, Rodney G., 2005. Integration of biological control agents with other weed management technologies: Successes from the leafy spurge (Euphorbia esula) IPM program. Biological Control. 35(3, Sp. Iss. SI). DEC 2005. 366-375. Lym, Rodney G., Deibert, Kenneth J., 2005. Diflufenzopyr influences leafy spurge (Euphorbia esula) and Canada thistle (Cirsium arvense) control by herbicides. Weed Technology. 19(2). APR-JUN05. 329-341. Lym, Rodney G., Nelson, Jeff A., 2000. Biological control of leafy spurge (Euphorbia esula) with Aphthona spp. along railroad right-of-ways. Biological control of leafy spurge (Euphorbia esula) with Aphthona spp. along railroad right-of-ways. Weed Technology. 14(3). July-September, 2000. 642-646. Lym, Rodney G., Nelson, Jeffrey A., 2002. Integration of Aphthona spp. flea beetles and herbicides for leafy spurge (Euphorbia esula) control. Weed Science. 50(6). November-December 2002. 812-819. Markle, Denise M., Lym, Rodney G. 2001. Leafy spurge (Euphorbia esula) control and herbage production with imazapic. Weed Technology. 15(3). July-September, 2001. 474-480. Mueller-Schaerer, Heinz, Schaffner, Urs., 2008. Classical biological control: exploiting enemy escape to manage plant invasions. Biological Invasions. 10(6). AUG 2008. 859-874. Olliff, Tom, Renkin, Roy, McClure, Craig, Miller, Paul, Price, Dave, Reinhart, Dan, Whipple, Jennifer., 2001. 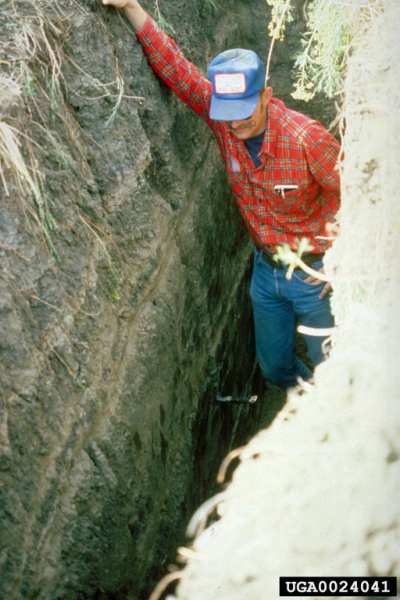 Managing a complex exotic vegetation program in Yellowstone National Park. Western North American Naturalist. 61(3). July, 2001. 347-358. Pritekel, Cynthia, Whittemore-Olson, Amanda, Snow, Neil, Moore, John C.2006. Impacts from invasive plant species and their control on the plant community and belowground ecosystem at Rocky Mountain National Park, USA. Applied Soil Ecology. 32(1). MAY 2006. 132-141. Rinella, Matthew J., Luschei, Edward C. 2007. Hierarchical Bayesian methods estimate invasive weed impacts at pertinent spatial scales. Biological Invasions. 9(5). JUL 2007. 545-558. Rinella, Matthew J., Maxwell, Bruce D., Fay, Peter K., Weaver, Theodore, Sheley, Roger L., 2009. Control effort exacerbates invasive-species problem. Ecological Applications. 19(1). JAN 2009. 155-162. Ringold, Paul L., Magee, Teresa K., Peck, David V., 2008. Twelve invasive plant taxa in US western riparian ecosystems. Journal of the North American Benthological Society. 27(4). DEC 2008. 949-966. Roehrdanz, R., Olson, D., Fauske, G., Bourchier, R., Cortilet, A., Sears, S., 2009. New DNA markers reveal presence of Aphthona species (Coleoptera: Chrysomelidae) believed to have failed to establish after release into leafy spurge. Biological Control. 49(1). APR 2009. 1-5. Scheiman, Daniel M.; Bollinger, Eric K.; Johnson, Douglas H., 2003. 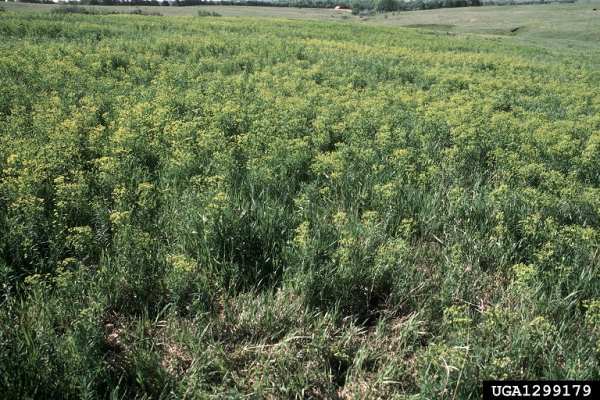 Effects of leafy spurge infestation on grassland birds. Journal of Wildlife Management. 67(1). 115-121. Summary: Impacts of spurge on grassland bird densities. Scheiman, Daniel M., Bollinger, Eric K., Johnson, Douglas H., 2003. Effects of leafy spurge infestation on grassland birds. Journal of Wildlife Management. 67(1). January 2003. 115-121. Schwab, Lori K., Raghu, S., 2006. 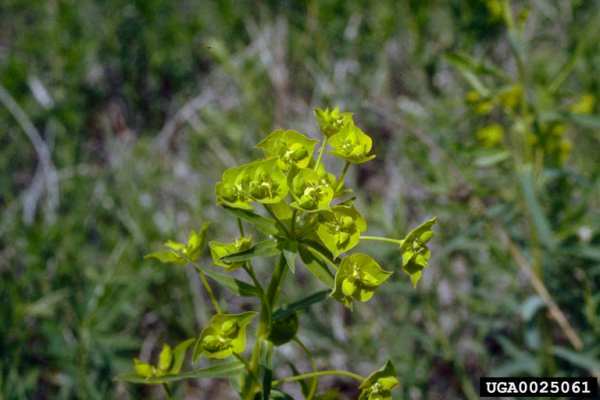 Leafy spurge biological control information and photo resource gallery. Australian Journal of Entomology. 45(Part 4). 2006. 345-348. Scott, Lisa K., 2008. Weeds cross borders project: A Canada-United States collaboration. U S Forest Service Pacific Northwest Research Station General Technical Report PNW-GTR.(694). JUN 2007. 153-155. Seefeldt, S. S., Taylor, J. B., Van Vleet, S., 2007. Reducing Euphorbia esula with a combination of sheep grazing and imazapic. Journal of Arid Environments. 69(3). MAY 2007. 432-440. Sell, Randall S., Bangsund, Dean A., Leistritz, F. Larry, 1999. Euphorbia esula: Perceptions by ranchers and land managers. Weed Science. 47(6). Nov.-Dec., 1999. 740-749. Skinner, Kerri, Smith, Lincoln, Rice, Peter., 2000. Using noxious weed lists to prioritize targets for developing weed management strategies. Weed Science. 48(5). September-October, 2000. 640-644. Taylor, J. Bret, Seefeldt, Steven S., Thelen, Tonya M., 2005. The use of short-duration intensive sheep grazing to increase sheep utilization of leafy spurge (Euphorbia esula L.). Journal of Food Agriculture & Environment. 3(2). APR 2005. 323-326. Thunhorst, Gwendolyn & Jil M. Swearingen, 2005. 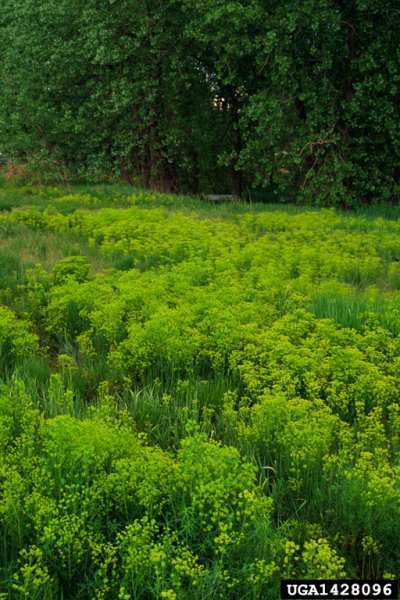 Factsheet: Leafy Spurge. Plant Conservation Alliances Alien Plant Working Group The Nature Conservancy, Arlington, VA. and Jil M. Swearingen, U.S. National Park Service, Washington, DC. Summary: Report on description, biology, effects of introduction, distribution, and management. Baker, John., May 2004. Aphthona flea beetles used to control leafy spurge. Aliens-L Archives. Bjerknes, Anne-Line, Totland, Orjan, Hegland, Stein Joar, Nielsen, Anders., 2007. Do alien plant invasions really affect pollination success in native plant species? Biological Conservation. 138(1-2). AUG 2007. 1-12. Duncan, Celestine A., Jachetta, John J., Brown, Melissa L., Carrithers, Vanelle F., Clark, Janet K., DiTomaso, Joseph M., Lym, Rodney G., McDaniel, Kirk C., Renz, Mark J., Rice, Peter M., 2004. Assessing the economic, environmental, and societal losses from invasive plants on rangeland and wildlands. Weed Technology. 18(Suppl. S). 2004. 1411-1416. Foley, Michael E., 2004. Leafy spurge (Euphorbia esula) seed dormancy. Weed Science. 52(1). January-February 2004. 74-77. Foley, Michael E., 2008. 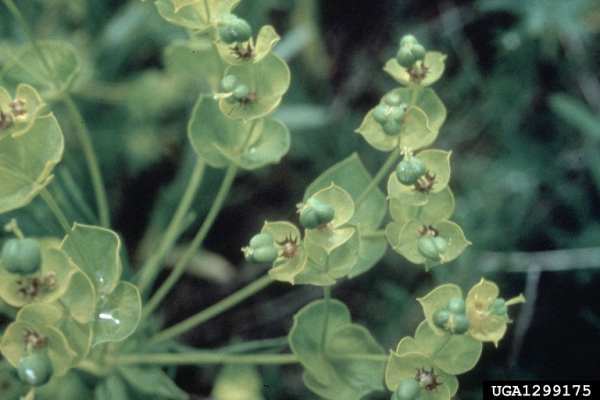 Temperature and moisture status affect afterripening of leafy spurge (Euphorbia esula) seeds. Weed Science. 56(2). MAR-APR 2008. 237-243. Montgomery, B. R., 2009. Effect of introduced Euphorbia esula on the pollination of Viola pedatifida. Botany-Botanique. 87(3). MAR 2009. 283-292. Olson, Bret E., Wallander, Roseann T. 2002. Effects of invasive forb litter on seed germination, seedling growth and survival. Basic & Applied Ecology. 3(4). 2002. 309-317. Selbo, Sarena M., Carmichael, Jeffrey S., 1999. Reproductive biology of leafy spurge (Euphorbia esula L.): Breeding system analysis. Canadian Journal of Botany. 77(11). Nov., 1999. 1684-1688. Trammell, Michael A., Butler, Jack L., 1995. Effects of exotic plants on native ungulate use of habitat. Journal of Wildlife Management. 59(4). 1995. 808-816. USDA-NRCS (Natural Resource Conservation Service). 2005. Euphorbia esula. The PLANTS Database Version 3.5 [Online Database] National Plant Data Center, Baton Rouge, LA. 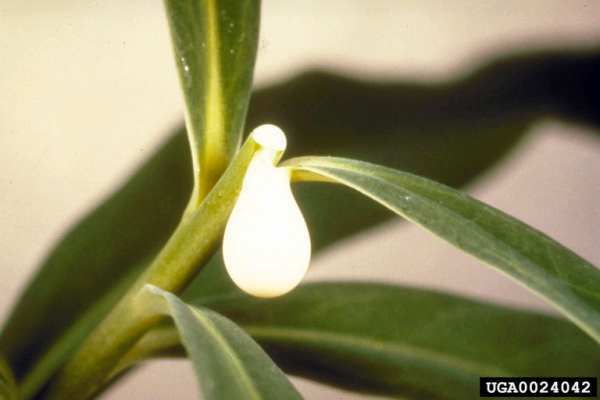 Summary: Available from: http://plants.usda.gov/java/profile?symbol=EUES [Accessed 12 March 2006]. Wald, Eric J., Kronberg, Scott L., Larson, Gary E., Carter Johnson, W., 2005. Dispersal of leafy Spurge (Euphorbia esula L.) seeds in the feaces of wildlife. American Midland Naturalist. 154(2). OCT 2005. 342-357.